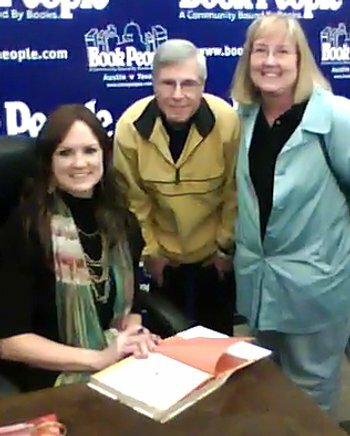 Yesterday night Kathy and I attended The Pioneer Woman’s book signing for her Cook Book at Book People here is Austin. Captured and cropped frame taken with iPod Nano video cameraI’m been reading and enjoying her blog for about a year ever since Stephanie told me about her. I like how she adoringly writes about her husband, AKA Marlboro Man, especially when he is wearing his chaps – I gotta get me some of those – yeehaw! What surprised me was that three of Kathy’s friends and co-workers read her blog too. Several asked Kathy to buy a cook book and get it signed for them. Jokingly I said that in payment they should not only reimburse us for the cost of the book, but we should also require payment in one cooked item from the book. Janet E was already there when I arrived a few hours before the signing. After her talk Kathy and I were waiting in line with hundreds of other women and they most probably thought I was here to support Kathy by carrying her cook books, whereas in reality I was the blog reader and Kathy was here supporting me and her friends. Some of the women knew I read her when I began to chat with a few of them about her recent hair color change from red to brunette. What was special was that her entire family was there too – husband, and four children, sister, and I think BIL. When we got up to her we mentioned that Justin, our son, and Stephanie, his darling girlfriend, worked for Federated Media, and she knew exactly who Federated Media was, but unfortunately didn’t know them, but that is expected since they’re involved with technology and marketing and not author relationships. Nevertheless, what fun! My father, Colin Stewart Watt Jr., died on November 21, 2009 from complications resulting from a fall in his apartment and the resulting hospitalization. My son’s blog post entitled My Grandfather passed away says it all. Best wishes my sweet Dad wherever you are. My thoughts are with you now and forever. I know, I know, it’s been a while. Sorry. A few years back my sweet wife bought me an iPod for Christmas. It’s an iPod Nano Generation 1 with 4GB. Since then I have used it almost everyday. I never thought I’d use it as much, but I do. I wear it to work and back, but I don’t listen to it at work. It’s my car radio where I get to choose what I listen to. It keeps me company on my many long runs. I typically listen to podcasts, and not music. My favorites are This American Life (NPR), Phedippidations (Running), The Story (APM), and Radio Lab (WNYC). I’ve tried an number of others, such as, comedians and they just don’t do it for me. I tried a book once from Project Gutenberg, but the mechanical voice again just didn’t do it for me. Maybe it’s something to do with not spending $ for the content. I don’t know. Nevertheless, with it I can zone-out and listen to voice-in-my-head chatting, discussing, explaining, and informing me of happenings in the world. It’s like my own little PBS/NPR/etc Radio Machine. Over the years I have had to replaced it or repaired it 2 times by sending it into Apple and getting a new one. Typically it was the result of running, and getting sweat in it. A cap with a pocket for the iPod fixed that issue. Well about a week or so ago, while helping at the Austin Triathlon, the screen went dead. It continues to operate, but I could only start it playing or skip to the next podcast. I found this difficult, because I like to page through the various podcasts and pick one out depending upon my mood. Not seeing the screen was not good. Apple iPod Nano (photo courtesy Apple.com)So today I went to the Apple store to get a replacement. 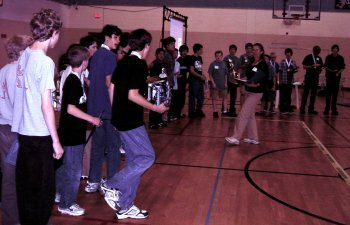 Knowing that the iPod shuffle was quite small and self-contained I thought it would be good keeping the elements and sweat out, but I rejected it because there was no screen. Pushing the little up/down thingamabob on the earphones just didn’t cut it for me. So I looked at the latest iPod Nano. Naturally it was more expensive, had much more memory, and included a radio and video camera. I don’t know if I’ll use all those gadgets, but I got a nice bright red 16GB one. Oh, and it’s a (PRODUCT)RED to help fight AIDS in Africa. But I didn’t get it for that, I just like red things. Anyways I’m happy again, and tomorrow morning I’ll be again on the roads with my iPod keeping me company. I can’t wait. Last weekend I went shopping as I typically do. While there I bought the normal stuff consisting of fruit, 2 gallons of milk, my favorite cereal, assorted meats, etc. When I arrived home I carried the stuff in and put it away. Two days later I noticed we had run out of milk, and I was surprised that I had only one gallon of milk. Then another day later I was running late, and I jumped in the car to head out to work when I noticed a funky smell in the car. I immediately realized where the missing gallon of milk went. Upon opening up the truck I found the milk on its side. Now inside the plastic gallon was a one-inch layer of white stuff, and the rest, a clearish liquid, had spilled on to the trunk carpet and then into the wheel well. Ugh. There wasn’t much I could do so I tossed out the gallon jug in the garbage, removed the trunk carpet (having to cut it to get it out), mopped up the liquid in the wheel well (ucky), and drove to work with the windows down. After work I hosed out the trunk, washed the carpet, but poured in some febreze, sprinkled baking soda all over. That night I left the windows and trunk open to air out. Well it’s been days now and the car continues to smell like a mixture of cheese and rotten milk. Double ugh. I don’t know what to do. Ideas anyone? Update: I’m always surprised how long it takes for a buyer to be separated from his money. If you go to Walmart it can be a matter of seconds or a few minutes. I think car dealerships should work the same way. It took me about five hours this time. Now it’s not all the dealer’s fault since I didn’t bring my loan agreement and car titles with me. So there was about an hour in the middle where I had to go fetch them and get lunch. Nevertheless it’s always interesting that the salesman talks to you, but can’t actually do the paperwork. That’s the business manager’s domain. 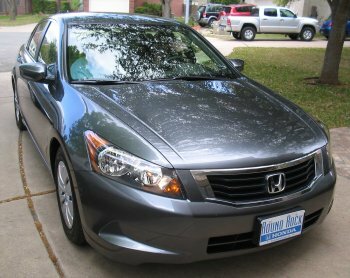 And because there is only one of them you have to wait for him to get to you (in these dire business times you would think that the Honda dealer would not be busy, but this was Saturday and he mumbled something about this being his 8th one that day). So once the paperwork was done, then I had to wait to get the car ready. As a result it took five hours. Regardless, the car is very nice. It is bigger and has more features (CD player, remote locks) as compared to our last one. Naturally as soon as I got it home it became Kathy’s car since she does mostly highway driving to get to work. Oh, and it’s too big for me especially since I use the parking garage and the spaces are tight.